The Xbox 360 is Microsoft's successor to the Xbox. It was launched on November 22, 2005 in North America as it features an improved CPU, better graphics, and advanced online gaming capabilities. It directly rivals Sony's PlayStation 3, and the Nintendo Wii. 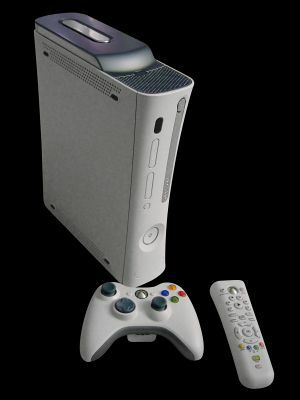 The original Xbox 360 was released in two versions, a basic model without any storage (relying either on proprietary memory units or a 20GB hard drive purchased separately), composite A/V cable, and a wired USB controller and a "premium" model with a 20GB hard drive, component A/V cable, and a wireless controller; later revisions of the basic model would include either a 256MB or 512MB memory unit as well as a wireless controller standard. The Xbox 360 Elite is an updated version of the original console, with a 120GB hard drive and HDMI output; later revisions of the original Xbox 360 would later include HDMI output and the 120GB hard drive was offered as a standalone upgrade for existing users. The original Xbox 360 was notorious for hardware failures, most notably the "Red Ring of Death". The Xbox 360 S is a major hardware redesign of the original design of Xbox 360 announced and released on June 14, 2010. The Xbox 360 S addresses the reliability issues of the original console, and comes standard with a built-in wi-fi adapter and a 250GB HDD drive; a lower priced version with 4GB of on-board flash memory was also available. The Xbox 360 S dropped support for the original model's memory units, instead allowing users to use any standard USB flash drive at least 1GB in capacity for portable storage. The Xbox 360 E, announced and released on June 10, 2013, is a refresh of the Xbox 360 S, featuring a chassis design similar to its successor, the Xbox One. The Xbox 360 E also has one less USB port and lacks support for optical digital audio output, component video output, and VGA video output; the only outputs available are HDMI and composite via a 3.5mm TRRS cable. The Xbox 360 was discontinued worldwide on April 20, 2016; however, Xbox Live services remain available. All Grand Theft Auto games released on the original Xbox can be played on the Xbox 360, with a free software emulator. This is not possible on Xbox Live Arcade. An Xbox 360 Premium with GTA IV. This page was last modified on 15 March 2019, at 03:59.